We decided to leave Ecuador in September 2016, but to where? We had reservations to tour Machu Picchu in Peru with a friend flying in from Seattle in October, so we had to be there by then. But, we had four weeks before that to either travel slowly southward through Peru or fly north to Colombia and visit some of our priority destinations in South America; Cartegena, Santa Marta, Tayrona National Park and the remote Guajira Peninsula on the far northern Caribbean coast. We chose Colombia. BOGOTA: Colombia’s capital city is as high in the Andes as Quito Ecuador, but much more polluted which is saying a lot considering the clouds of black exhuast in Quito. We knew that before we came and just planned on using Bogota as a staging point to move on through Colombia. We stayed at the Golden Hotel near the airport for $55/night, a bare-minimum spartan hotel in an exhaust filled working class neighborhood. We had specific goals in Colombia; to visit the colonial city of Cartagena on the Caribbean coast and explore the Caribbean coastline from there, and to see if we could get into the Macarena National Park to see the Cano Cristales, a spectacularly colored river. If time permitted, we might get into the upper Amazon at Leticia in the far southeastern corner of Colombia. NOTE: Throughout this article we used the average exchange rate for October 2016 of 2,700 Colombian Pesos (COP) to one U.S. dollar (USD). We spent the next day in Bogota riding the cable car to a view point over the city, touring the mansion of Simon Bolivar, the 19th century “librador” (liberator) of South America, and then walking through La Candelaria (the colonial city center of Bogota). We ate ajiaco (ah-hee-AH-coe; a soup of corn, vegetables and chicken) in a local restaurant. We toured the Fernando Botero museum and appreciated the humor of his famous paintings and sculptures of exagerated fat people and animals, later laughing when we saw people on the street that resembled his paintings. We stopped at a tourist information office on the main plaza in La Candelaria and found that tours to Macarena National Park and the colorful Cano Cristales were expensive; over $1,500 for us both, and required a small plane flight to the area. We were now aware that national parks in South America were generally disappointing, so we decided to pass on Cano Cristales. But, tours out of Cartagena into the mountains, beaches and deserts of the Caribbean sounded much more interesting and affordable. The tourist information representative said we could go to the coast and find anything we wanted. We thanked her and took a death-defying taxi ride back to the hotel, the driver speeding down streets on the wrong side of the road, hopping over curbs and through potholes, and squeezing through traffic where it seemed imposible to pass with me cheering him on the whole way. As polluted, hectic and huge as Bogota is, we still had fun there; but the exhuast fumes reached us even on the sixth floor of the hotel and, at $55/night, the Hotel Golden was overpriced, basic and rough. We flew out of Bogota the next day to the colonial city of Cartagena on the Caribbean coast. CARTAGENA: Hot and humid, but with a well preserved colonial center; Cartagena is Colombia’s party town. It is one of the oldest Spanish settlements in South America founded in the early 1500’s and the Caribbean vibe is strong here with fresh ceviche, winding narrow streets, and live caribe music in the little plazas at night. At $46/night the Casa de las Palmas was spendy by Colombian standards, but it was a comfortable place with hammocks in the courtyard, a good restaurant, just a couple blocks from the lively Plaza Trinidad and best of all, located in the quiet Getsemani district of old town. After a lunch of ceviche and cold beer in the hotel (excellent) we spent our first afternoon walking around the Getsemani district, a 17th century suburb within the stone walls of the 16th century town. Sonia stopped at a beauty salón for a facial while I got a massage waiting for her. Refreshed we walked some more, found a tour operator in a local hostal and saw tours to the mountains, towns near Tayrona National Park, and into the remote Guajira Peninsula at very affordable prices (a five day/ four night trek into the Sierra Santa Marta for $350 each including all food, gear and accommodations, and a four day/three night trip into the Guajira Peninsula in 4X4 jeep for $325 each). We were tempted to siogn up for one of the tours, but decided to wait until we reached Santa Marta, much closer to Tayrona Park. We had planned on moving on to Santa Marta, a city near Tayrona National Park, or to Tagunga, a smaller town outside of Santa Marta, but both places had a reputation for being loud party places. He said Palomino, a small town near Tayrona park, was quiet, clean and had small guest houses. He also had transport in small vans to these places, about four hours from Cartagena. We decided to go to Santa Marta where we could find tours to the Guajira Peninsula and into the nearby mountains and bought tickets for a van ride to Santa Marta the following day (45,000 pesos each – $17 usd). Walking to the main waterfront and harbor we noticed bumper stickers and signs saying, “vota si para la paz” (vote yes for peace). We discovered that a general election had been held to vote yes or no for an agreement between the Colombian government and the FARC (para-military guerillaas that have been fighting the government for decades). Apparently the vote was in and it was for peace. An official signing ceremony was beng held the following night at the convention center in Cartagena. NOTE: The FARC, Revolutionary Armed Forces of Colombia, is a socialist guerilla group that formed in the mid 1950s to counter the repressiver right-wing Colombian government of those times. Over the next four decades the FARC resorted to drug trafficking to fund their operations and kidnapping to recruit new soldiers. Large áreas of Colombia were controlled by the FARC and the government responded with para-military death squads that rampaged across the country murdering citizens suspected of being FARC sympathizers. The country descended into an undeclared civil war where kidnappings, murders and terrorist bombings were common. Colombia became the cocaine trafficking capital of the world while thousands of refugees fled to Central America and beyond. For many years Colombia wasn’t safe to visit. By the turn of the century the people of Colombia were tired of war and the FARC started to weaken. Finally, in 2016, FARC leaders and the government agreed to hold a general vote of the people of Colombia; for peace, or not. The people voted for peace, although the issue of disarmament of the FARC is still contentious. We were in Cartagena at the time this historic agreement was formally signed. We finished our day with a fresh fish dinner at the hotel and went to bed by 9 pm, exhausted. The next day we walked through Getsemani to the original “old town” along the shores of the Caribbean. It was a series of narrow streets winding through 16th century buildings with balconies covered in bougainvilia and past small plazas where local women in brightly colored dresses were selling mangoes and yucca bread to tourists from all over the world, mostly European. We returned to our hotel to cool of in the small pool with a couple of beers, then ate a lunch of fish and rice before taking a siesta. That evening we walked back to old town and took a ½ hour horse and buggy ride through the colonial city center. Afterward we walked back through the town and watched a Caribe dancing group in the main plaza. Then we walked to a restaurant specializing in Caribbean lobster, La Langosta (The Lobster). We had a fine, but expensive meal of lobster in garlic sauce with a bottle of Chilean chardonnay. At $120 usd it was an extravagant meal for us, but we had earned it after our tough trip through Ecuador and Bogota, so we had no complaints. It was Saturday night in old town and every plaza was filled with music and open bistros full of tourists. After dinner we took a taxi back to our hotel and went to bed at midnight, happy to be in our quiet hotel away from the partying and noise. Cartagena had been great, but the next morning we would leave for Santa Marta. SANTA MARTA & THE GUAJIRA PENINSULA: If Cartagena is the party town of Colombia; then Santa Marta is the adventure backpacker’s capital of Colombia. Santa Marta is rougher around the edges than Cartagena. It’s a hot, humid port town with tramp freighters and container ships in the harbor and prostitutes patrolling the central plaza. Its “old town” isn’t near as nice as Cartagena’s, but was still nice particularly around the touristy Plaza de los Novios (plaza of the lovers). But, Santa Marta is the jump-off point into nearby Tayrona National Park with its Caribbean beaches, the snow-capped Sierra Nevada de Santa Marta and the remote deserts and beaches of the Guajira Peninsula beyond that. For all of that backpackers and adventurers flock to gritty Santa Marta and the hostals are full of bearded and tattooed twenty-somethings from all over the world. And, after a while, Santa Marta grows on you and we came to like it after a few days. NOTE: Tayrona National Park and the Guajira Peninsula are on the northern Caribbean coast of Colombia. Here the tropical lowlands collide with the Sierra Santa de Marta; an isolated mountain range at the end of the Andes. The Sierra Nevada de Santa Marta rises abruptly from the Caribbean shore, climbing through cloud forests and jungle to the snow and glaciers of the high peaks that stand over 5,700 meters (19,000 ft) above the tropical lowlands surrounding. The Sierra Nevada de Santa Marta is the highest coastal mountain range in the world and populated by indigenous groups like the Wiwa and others. Below the mountains and westward along the Caribbean shore toward the city of Santa Marta are palm lined tropical beaches while east of the mountains the deserts of the Guajira Peninsula (wah-HEAR-ah) sweep to the north ending in Punta Gallinas, the northernmost point in the continent of South America. The Guajira Peninsula is an autonomous region within Colombia, governed by the Wayuu people. The Sierra de Santa Marta forms a rain shadow over the Guajira Peninsula making it a hot, sand-dune filled desert while southward from the Sierra is jungle and cloud forests that stretch along the Caribbean coast from Santa Marta to Cartagena and beyond. 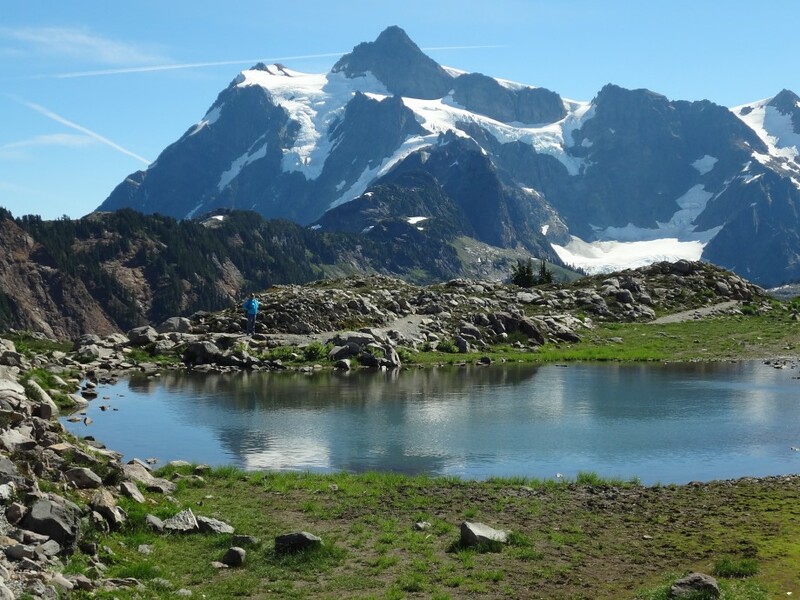 The whole area is a remarkably unique with deserts, lush tropical forests and glacier covered high peaks all packed close together. From Cartagena we took the SolMar bus, a 16 passenger van, for the four hour ride to Santa Marta ($16 each one way). In proper Caribbean style the van was crammed full of passengers and the side sliding door wouldn’t close. But the driver tied the door shut with some nylon clothesline while Sonia and I talked him into letting us sit up front with him and off we went. We drove through the Caribbean coast, passed the sprawling shanty-town slums of La Cienega, sweltering and stinking in the mangrove swamps outside of Santa Marta. We arrived in Santa Marta to find that there was no power or water in the whole city (a failure at the main electrucal substation). We checked into out hotel, the Hotel Salamandra (the salamander hotel), located a half block from the harbor in a local, workingclass neighborhood, but on the edge of the tourist area of “old town.” At 103,000 pesos ($40 usd) it was a reasonably decent deal. Then the power and water were restored and it turned out we had chosen well; the hotel was off the noisy main streets, but walking distance to the restaurants and bars of the Plaza de los Novios. It had a small pool which we were finding invaluable to escape the incesssant hot, humid tropical heat. As I relaxed on the tiny roof deck that evening a huge flock of fifty or more green parrots flew into a large catalpa tree behind the hotel. It looked like this place was going to work out. We immediately went to work finding tour operators for trips into the mountains, along the beaches of Tayrona and into the remote Guajira Peninsula. The hotel manager Lisa contacted ExpoTurs and we found a 3 day/2 night tour into the Guajira for $350 for us both (including transport by 4X4, food and sleeping in hammocks along the way). It wouldn’t leave for another two days, but we booked it anyway and our hotel said we could store our extra backpacks with them while on the trip. Since we had a couple days before the Guajira trip we booked another trip; a one-day tour to the tiny coffee-growing town of Minca, about an hour and a half drive into the mountains behind Santa Marta. That was enough planning for now, we’d figure out what we wanted to do after that later on. Having that business taken care of we turned our attention to more immediate problems: cold beer and dinner. We walked through the alleyways with boulvvards where a meter-long green ignuana startled Sonia as it ran up a nearby tree in the park and found the tourist area around the Plaza de los Novios (plaza of the lovers). This would become our center of activities for the rest of the time we were in Santa Marta and we had fine meals of pork chops in passion fruit sauce or plates of fresh shrimp. I found Club Colombia Dorada (dark, or golden beer), fairly full-bodied and refreshing after the disappointingly limpid and tasteless Pilsner beers of Ecuador. The following day we got up early for our taxi ride up into the cloud forests and mountains to tiny Minca where we met Joe of Joe’s Tours and his daughter Andrea. The rest of our group arrived; a young English woman and a French-Canadian couple. With Andrea leading us we walked three kilometers up a muddy road to a beautiful waterfall in the cloud forest. After a refreshing swim in the pool under the waterfall we walked back to Minca and then along a back road and footpath to Joe’s house where he fed us a delicious lunch (turns out Joe is a chef). We enjoyed the view over the coast and Santa Marta from the deck behind Joe’s house and he gave us a tour of his place, fascinating and built from bamboo. Then he showed us how chocolate is prepared from the raw fruit of the cacao plant through roasting the seeds and finally prepared a thick, sweet drink from the ground, roasted seeds. I liked the nutty, slightly bitter taste of the roasted seeds before being ground into chocolate powder and sweetened with sugar. After that we walked back through Minca and then above into a coffee plantation where Joe showed us how coffee is grown and prepared. As the sun set over the could-forested mountains we sipped freshly ground coffee from the plantation. We walked back to Minca and me tour taxi for the ride back down to Santa Marta. The Minca trip had been excellent, far better than we had hoped. But tomorrow we would head into the remote Guajira Peninsula and had to leave early in the morning, so we went to bed early. Next day up at 4 am to meet out taxi ride to Riohacha where our tour into the Guajira started; a 3 ½ hour ride from Santa Marta. We had signed up for a two night tour into the Guajira so we packed our day packs with a change of underwear, swimming suits and basic toiletries leaving our bigger travel packs and clothes at the Hotel Salamandra where we would return in three days. Wading through a line of sleeping dogs on the street we loaded the taxi and started the drive northeast towards Riohacha. As we passed tiny Palomino we stopped on a bridge over a pretty jungle river and could see the snow-capped peaks of the high sierra in the morning light. We picked up another passenger at a hostal in Palomino (Liem, an Australian woman traveling alone), who was also going to the Guajira but on a different tour. We arrived at Riohacha and met our tour guide, Francisco Daza (Franko) and the rest of our tour group; Katrina a young woman from Scotland, Hector from Popayan Colombia and his two friends and twin brothers, Juan and Carlos. In total there were seven of us and since everyone spoke Spanish we soon coalesced into a tight group, joking and talking as we rode along. We loaded into the 1998 Toyota Land Cruiser that we thought would be our transportation for the next three days (not knowing the mother nature had other plans for us) and headed of towards the Guajira. As we drove along the lush jungel gave way to grassy savannah, then dry savannah, and finally to a harsh cactus desert. And, it got hot – around 40 C (around 100 F). Hot, but still humid making it very uncomfortable and thank god the Land Cruiser had a strong air conditioner. We stopped at a salt works where water from the Caribbean is evaporated in pools and the salt crystals collected. We passed makeshift stalls along the road where people sold illegal Venezuelan gasoline from any type of container they could find from coke bottles to plastic jugs. Then on to Uribia, the self-proclaimed Indigenous Capital of Colombia where we filled up the Land Cruiser from one of the bootleg gasoline vendors. Now we were in the the Guajira proper. Uribia had the feel of a frontier town; dirty, hot, hectic and loud. As we left Uribia the sandy ground of the surrounding desert was carpeted in broken glass, plastic bags waved in the hot breeze from every available bush, and the area was devasted by severe overgrazing with half-wild goats everywhere. As we drove along the graded dirt road we passed local Wayuu people traveling in fantascially overloaded pickup trucks. We passed Wayuu villages of stick and mud houses in the desert where barefoot children in rags would run towards us with outstretched hands hoping for treats (we had been advised before leaving to bring small bottles of water or sweets for the kids). Every so often a kid would have a rope tied off to a bush and pull it across the roadway to stop us hoping for treats. The whole area was gripped in severe poverty and fresh water was in perpetual shortage in this hot, dry desert by the sea. The graded dirt road we had been traveling on gave way to sandy, muddy two-tracks and finally those gave way to open desert with deep sand and muddy wallows; we were driving in four-wheel mode full time now and it just got hotter. After four hours of grinding through the desert we reached Cabo de la Vela (land’s end at the candle) and our first night’s stop. We went to a beautiful desert beach near Cabo de la Vela before returning to the Uribi Ranch, a collection of wooden huts on the shores of a shallow bay of the Caribbean, where we found hammocks waiting for us strung up in a open walled palapa (thatch-roofed hut). We swam in the warm Caribbean, had a dinner of fresh red snapper, and as the sun set climbed into our hammocks to sleep though the sultry desert night, each of us with our own resident dog sleeping under our hammocks. Morning, breakfast and off to our next destination; Punta Gallinas, the northernmost point in continental South America. Now we were driving in low-range four-wheel drive through muddy lowlands or over deep sandy ravines. We stopped at other empty beaches and bays before reaching a huge, golden sand dune where we parked and walked up to see a spectacular rocky shoreline with the Caribbean Sea stretching out beyond it. We ran down the steep dune and jumped into the rough surf for a swim, but it had started raining and we wondered how this would affect the miles and miles of muddy, sandy jeep tracks we had been traveling on. From there we drove on to Punta Gallinas, a low, rocky point with the concrete ruins of a lighthouse full of half-wild goats and piles of rocks stacked by other visitors to this remote land’s end at the very northern tip of South America. Still raining we turned south (no other way to go) and off across untracked desert to Bahia Hondita, a Wayuu community an hour south of Punta Gallinas, and our last night’s stay in the palapas at the Huespedaje Alexandra (Alexandra guesthouse). 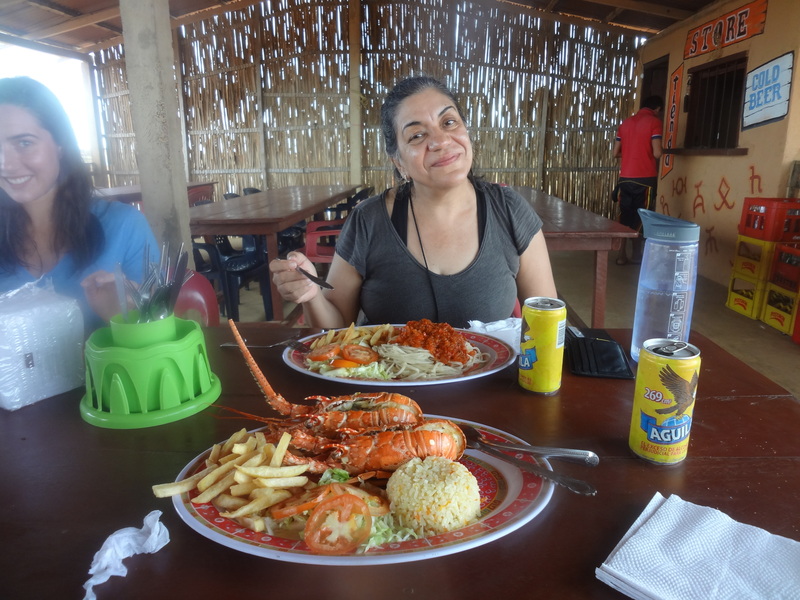 Sonia and I had accepted an offer to upgrade our meal to a lobster dinner (additional 20,000 pesos each – $7 usd) and we ate our tasty spiny lobsters in the elevated, open walled dining hall not knowing that this would soon become our headquarters for the next four days. Other groups of travelers had arrived at the Huespedaje Alexandra as well; twenty-one in total including a group of Colombians from Bogota, a French couple, a group of young Germans, an Austrian with his Colombian girlfriend, and a fortyish couple from South Africa celebrating their wedding on a round-the-world trip. Altogether there were now twenty-eight tourists; mostly young backpackers that had caught rides to this remote outpost with other travelers while the Germans had a tour, but their guide had left them at Bahia Hondita saying he would meet them back in Riohacha. Franko, our guide, was the only guide left in the area. As night fell we all retired to our hammocks strung up together in a series of concrete floored palapas. It had been raining on and off all day, but we thought it was just normal tropical thunderstorms, not uncommon in this area. But at 5:30 in the morning the winds and rains increased dramatically and we all got soaked in our hammocks as the rain blew in from the open sides. We assembled in the dining hall and found out that a hurricane was heading our way, Hurricane Matthew, and it would hit us tonight. Our first thought was to immediately load up the Land Cruiser and make a run for Uribia, but the roads had already become impassable. Franko said the roads would remain impassable for at least a few days and we would be stuck in Bahia Hondita. The buildings around the Wayuu community and the Huespedaje Alexandra were mostly flimsly constructed of wood plank walls with plastic corrugated roofs lightly attached with wire, or just open sided palapas; nothing that would stand up to hurrican force winds. The Wayuu were simply not used to severe weather since no tropical storm had passed the area in almost thrity years. But a storage building (soon to be known as the bodega) and the kitchen had concrete block walls and heavier roofs attached with screws, so we organized into groups to prepare them for the hurricane; some nailing boards over the open Windows of the bodega, others stockpiling bottles of drinking wáter, and another group stringing up hammocks in the bodega and kitchen until they were packed full of hammocks swinging from hooks in the concrete walls. Local Wayuu residents seemed amused by our efforts; laughing and taking photos of us. Electrical power was supplied by a large gasoline-powered generator that the Wayuu ran for six or seven hours during the day and there was satellite cell phone service, so we could charge up cell phones and call out. The Huespedaje Alexandra now looked like a refugee camp, but the rains didn’t come – not yet anyway, and we waited out the rest of the muggy day in the dining hall playiing games, making phone calls and talking. But our group was still on tour and in the calm before the storm we took a local fishing boat out into the Bahia Hondita along with Katrina, Juan, Carlos, and Hector past the mangrove shores to some islands where flocks of pink flamingoes stood in the shallows and roseatte spoonbills roosted in the mangroves. We watched a spectacular sunset from a beach near the mouth of the bay before returning to the settlement to sleep in the now crowded, smelly bodega. As night fell so did the rains and we found the bodega leaked badly. Water ran down the walls soaking everything on the floor and it was pitch black inside since the generator had been shut down for the night. Luckily, the center of Hurricane Matthew passed 100 kilometers north of us, but we still had 60 mph winds and torrential rains. The roof danced and rattled, but stayed in place. No one slept as the wind and rain pounded the bodega, we all waited in silence, in the dark, waiting for the roof go blow off. But it held and as dawn arrived the wind and rain slacked and finally stopped. It was the eye of the storm; the calm before it all started up again. But now the whole community of Bahia Hondita was flooded in shallow pools of muddy, polluted water. We assembled in the dining hall, the only elevated building above the mud, and as the generator was started we got the latest news. Franko had been in constant contact with the ExpTurs office and the owners of the Huespedaje Alexandra. He reported that overland travel out of the Guajira wouldn’t be possible for at least a week or more – the four-wheel tracks we had driven in on were flooded. All ports along the Colombian coast had been closed, so no boats could go to sea. Evacuation by air wouldn’t be possible since the winds were still too high for helicopters and military forces were busy with other hurricane related emergencies. And, on top of all that, Colombia was in the midst of national elections to vote whether to accept the peace negotiated between the FARC and the government to end the fifty-year long civil war between them. Now we knew we were stranded for the long term. Franko said no one would pay attention to a bunch of foreign tourists stuck in the Guajira and suggested we make a video of our situation and send to national Colombian news. He said we should call our respective embassies to have them put pressure on the Colombian government to evacuate us. The theme song to Gilligan’s Island came to mind. We organized into teams to take inventory of our potable bottled water supplies (all other water at Bahia Hondita was salty water collected for use in bathrooms and general cleaning). We inventoried food and generator fuel. We had two days of supplies left and started a rationing plan – two liters of water per day per person, to be cut back if we were still there after tomorrow. The Wayuu people cooking and supporting us were great; Careneli a young Wayuu woman was the general manager while another local resident, Antonio, was in charge of the supplies. We put all the water in a locked storeroom with Antonio keeping a record of distributing it. I called the American Embassy in Bogota while the others called their embassies; French, German, South African, Austrian and the United Kingdom (Katrina from Scotland, so the UK). The other embassies were unresponsive, but I talked to Matt Zamary in the U.S. Embassy in Bogota who said he would call the Colombian National Police for help and would call me back later (on Franko’s phone). For the next two days Matt kept in contact with me and though the national police never responded we’re still thankful for his efforts. We made some videos of us looking pitiful standing around in muddy water and sent it to Colombian national news. After that we felt that we’d done what we could to get ourselves evacuated and so we settled into another long day at Bahia Hondita. As we went to sleep in the now stinking and soaked bodega we could hear, almost feel, the surf pounding the coast two kilometers away. Day three at Bahia Hondita. The heaviest rains had passed and the ponds of muddy water had receded somewhat, but everyone was wet and tired. The cook quit and Sonia along with some of the Colombian travelers fell in preparing food for the group. We walked out to a viewpoint over the Caribbean to see the surf breaking in twenty foot rollers at the mouth of the bay and the sea churned into a rough chop from the storm surge. Obviously we weren’t getting out that way. The day passed slowly until evening when Antonio retrieved a television set from somewhere and started the generator so that we could watch the news. 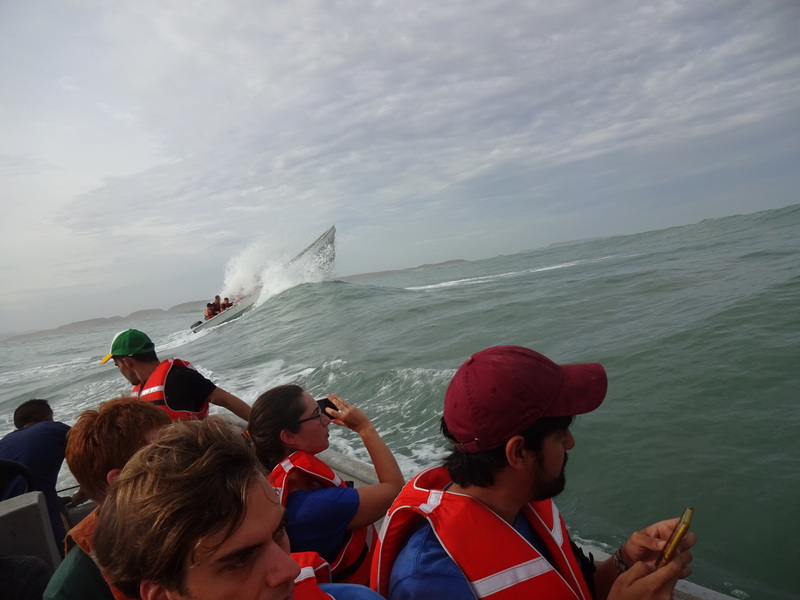 They aired our video and then interviewed the governor of the Guajira who responded that we knew the storm was coming and that we were just a bunch of thrill seekers that got stuck and weren’t in any trouble. I think that’s when we knew we’d have to get ourselves out of the Guajira instead of being rescued. And, the vote was in on ratifying the agreement between the FARC and the government. By a narrow margin the vote was no to the agreement. There would be no peace for now and the Colombian peso immediately dropped from 2,700 pesos to the U.S. dollar to 3,000 per dollar. At least our money would go further if we could escape from Bahia Hondita. The rain and wind had slowed to the point we could move out of the now stinking bodega and kitchen and while we strung up the hammocks outside in under the palapas once again. We went to bed thinking about all of that. Day four at Bahia Hondita. The salt water reservoirs (plastic tanks) that serviced the bathrooms and provided general cleaning water ran out and the bathrooms soon bacame fetid and foul. We had a day of water and food left before we would have to cut rations in half to stretch them out a few more days. Everyone was still in good spirits, but showers and clean clothes were dim memories by now. And, it was getting hot again and along with the heat came mosquitos and flies. The pools of polluted water all around the compound had receded, but still provided a steady stench and potential disease source while stray dogs, pigs and goats wandered through the compound adding to the pollution. We were still trying to get the attention of the Colombian National Police, the Colombian military and I was still in contact with the American embassy, but all resources were busy elsewhere attending to emergencies due to the hurricane. I took a walk outside of the compound and noticed that the surf pounding the shoreline had diminished noticeably. That gave me an idea; there were sturdy, fiberglass fishing boats in Bahia Hondita and experienced skippers to operate them. Maybe we could use them to breach the breakers rolling into the shallow mouth of the bay and once at sea, travel southward to a port that had a road link out. It was a risky idea, but voluntary. Those that didn’t want to risk it could stay in Bahia Hondita while those that left would reduce the impact on the remaining food and water at the camp. Excited about the idea I walked back to the dining hall and found that Franko already had the same thought and was in contact with ExpoTurs in Riohacha and the owner of the Huespedaje Alexandra who owned all the fishing boats there. The word soon came back – we would go for it. I think the owner and ExpoTurs were genuinely concerned for our welfare, but also worried about tourists getting sick and the bad press that would result. Regardless, Franko, me, Sonia and the South African couple, Kate and Eric were the only ones who knew the plan and Franko asked us to keep it quiet since he still had to get permission to enter the industrial port of Punta Bolivar, a coal shipping port two hours by sea south of us. Later in the day we received permission to land at Punta Bolivar so after a dinner of rice and fish, Franko (in Spanish) and I (in English) announced to the group that we would leave in two open fishing boats at 5:30 the next morning. Everyone’s spirits lifted and we all went off to pack for the trip and go to bed early to rest up for the upcoming journey. Sonia and I spent the night in one of the cockroach infested wooden shack cabins; not a very pleasant place by then. Day five at Bahia Hondita. The day broke with a spectacular sunrise, but the surf had risen again and we could hear the roar of heavy breakers pounding the beach. Spirits fell, but Franko soon arrived and said we were leaving anyway while Careneli fed us fresh arepas (thick, fried flour tortillas with cheese) and coffee. She had never faltered and always had a smile during the whole ordeal. We handed out life vests, walked down to the flimsy boat dock in the mangroves and loaded our packs into the open boats; a twenty-two foot and an eighteen foot open launches. But, they were equipped with fifty horsepower outboard motors and built for sea travel out of sturdy fiberglass with high sides and bows. Including the skippers for each boat plus a couple of deck hands each there were thirty four of us making the journey; twenty in the large boat, fourteen in the smaller one. The whole Wayuu community came down to watch us pack into the boats and motor out through the mangroves into the quiet bay. We hit the first breakers as soon as we reached the mouth of the bay; fifteen foot high, white capped combers and coming in fast with a roaring, hissing sound. At times our boat was airborne; landing in the troughs between waves with a tooth clattering slap; but the skipper knew his stuff and kept our bow into the waves and adjusted the speed to match the rhythm of the incoming breakers. Then our motor stalled and we broached sideways as a large comber washed over us almost washing some of us overboard and nearly capsizing the boat. A deck hand managed to restart the motor before the next wave hit us and we quickly turned to face the next breakers and battled on through the surf to the open sea beyond. Even the open sea was rough, still whipped into fifteen to twenty foot whitecaps from the storm surge and we’d sink down between the huge waves only to bob back up again when we could quickly look around to see where we were. After a couple hours we could see the loading docks of Punta Bolivar and soon we were heading back to shore and into a quiet mouth of a bay. We motored up the slack waters of the bay and reached a muddy fisherman’s beach where local Wayuu free divers were collecting lobsters. The owner of the Huespedaje Alexandra was there to welcome us and still soaked from the passage we jumped off the boats and walked through the hot, stinking mud of the tidelands and up a rocky hillside to the awaiting Land Cruisers at the top. By then we looked like a group of refugees; wet and muddy, but happy to have escaped. We drove an hour to Uribia for lunch and another two hours to Riohacha and the ExpoTurs office where local news channels were waiting and interviewed us. Still smelly and mud-covered we said our good-byes to Hector, Juan and Carlos while Katrina rode with us in a taxi the four hours back to Santa Marta. We reached our hotel in Santa Marta at dusk and immediately showered in went to bed, exhausted. The next day we washed out our muddy sandals and packs in the laundry room of the hotel and sent our filthy clothes out to be washed. Thank god we had left our main packs in the hotel and we had fresh, clean clothes to wear. Then we walked down to the ExpoTurs office to give them a 50,000 peso tip for Franko and another 50,000 pesos to pay for our night in the cabins at Bahia Hondita and the rest for a tip to Careneli and Antonio who took such good care of us there. We had two or three days left before we had to fly to Peru and we considered going to the colonial city of Villa de Leyva in the mountains outside of Bogota, but we were too tired and spent the rest of our time in Santa Marta instead. We walked around town, toured the small but fascinating Museo de Oro (museum of gold) that documented local indigenous cultures of the Sierra Santa Marta and the life of Simon Bolivar who died in Santa Marta. We ran into the Australian woman, Leam, who had also been stranded in a different part of Bahia Hondita and was rescued by the Colombian navy. By then we were so familiar with Santa Marta that we recognized all the hookers hanging out in the park by our hotel. Then it was time to leave and we flew out to Bogota just as Colombian president, Juan Manuel Santos, was flying in to survey the hurricane damage. We would stay in a hotel near the Bogota airport and fly out to Cusco Peru early the next morning. We didn’t make it to the beaches of Tayrona National Park, to the colonial cities in the Colombian Andes or to the Amazonian Basin at Leticia. All of that remains to be done. But we did get to know the Colombian people and found them to be friendly, fun and helpful. We like Colombia. I think we’ll come back, without the hurricane next time, but now; on to Peru, Cusco and Machu Picchu.